This weekend is the largest trade and retail gun show in the UK. The British Shooting Show 2016. 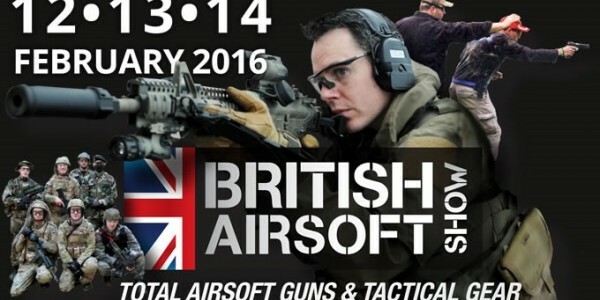 Mainly focussed on guns, however some airsoft retailers will attend! For those in Europe able to visit the show, visit the Airsoft Exibitors this weekend on 12TH, 13TH, 14TH FEBRUARY 2016. STONELEIGH PARK, WARWICKSHIRE CV8 2LG. Retailer included are Stirling Airsoft, Gunfire from Poland, Just-Cause Airsoft, Templar Airsoft and Dave's Custom Airsoft. Sounds great to us! OPENING TIMES: 8.30am to 4.30pm on all three days of the show. Car parks open at 6.45am and are free. TICKETS: You can buy tickets on the day (£20 per adult, £9 per child aged 8 to 15 years) but it’s cheaper to buy advance tickets online. You can also call the ticket hotline, tel 01258 858448.